No one thinks much of Black Gold because he is so small. But Jaydee sees something special in his eyes. He knows Black Gold would be great if he was his rider! Finally, Jaydee gets his wish. And Black Gold grows strong and fast under his careful hands. Soon it will be time for the most important race in America. Do they really have what it takes to win? Black Gold’s inspirational story proves that the power of love and dedication can make any dream come true. 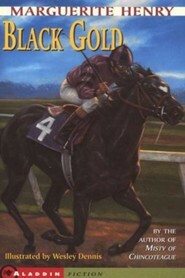 Set against the thrilling and colorful world of Thoroughbred horses, Black Gold is the true story of a legendary horse and his determined young jockey. Marguerite Henry was the beloved author of such classic horse stories as King of the Wind, Misty of Chincoteague, and Stormy: Mistys Foal, all of which are available in Aladdin paperback editions. 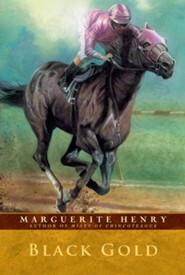 Wesley Dennis was best known for his illustrations in collaboration with author Marguerite Henry. They published sixteen books together. I'm the author/artist and I want to review Black Gold - eBook.